Welcome, friend!! In a world where there is no shortage of mediocre games, you've unearthed a core supplement for the game everyone's raving about: HackMaster RPG, winner of the prestigious Game of the Year Award by gamers like you and the Academy of Adventure Gaming Art and Design. 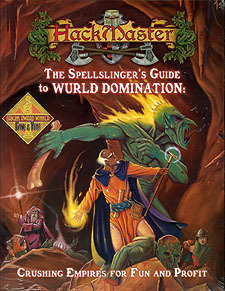 For those of you unfamiliar with the HackMaster game, it's a fifth revamped AD&D, a fifth revamped AD&D 2nd edition, a fifth new material and two-fifths attitude, so if you know how to play any of those games, you already have the basics down. You're two decades older than your fellow adventurers; You roll a mere d4 for hit points; You can't wear armour; You lug around a heavy tome wherever you treck; But you have big plans. Very big plans. Finally, help arriveth. * Detailed information on the eight specialists and eight new Double Specialists. * 19 new Sole Practitioners including the Pyrotechnician, Power Speaker and Demolitionist. * New Unorthodox and Holistic Practitioners including the Blood Mage, Wild Mage and Painted Mage. * Over 100 new spell including spells at every level for every sole practice. * Over a dozen new magic-user quirks and flaws. * Over 20 new magic-user skills and talents including Spell Razor, Calligraphy and Spell Tattooing. * New magic-user priors and particulars detailing your character's schooling, including the commencement speaker and commencement speech quality tables. * New magic-user packages and personalities, each with their own special benefits. * Detailed rules for the construction and modification of spell books. * New rules on cramming, spell refreshers, re-copying spells. * A detailed description of magic-user academies and their uses. * Descriptions and rule information for the 13 most powerful magic-user societies including the Circle of Sequestered Magics. * A new magic-user spell planner including all new and old spells. * New rules for unusual familiars including potted plants and tape-worms. * Detailed analysis of Magic-Users and Hack. * Rules for casting in unusual or difficult conditions. * An analysis of the theory and uses of ley lines including a discussion of the three theoretical ley lines. * Rules on spell copyrights, spellwar, spell licenses and spell hacking.